Blending family memories with current experiences, Elizabeth Kendall creates simple, graceful sculptures. She works with lush white porcelain, raw wood, rigid steel, or vibrant glass. Her abstract wall pieces and vessels are both delicate and strong, simple and complex. 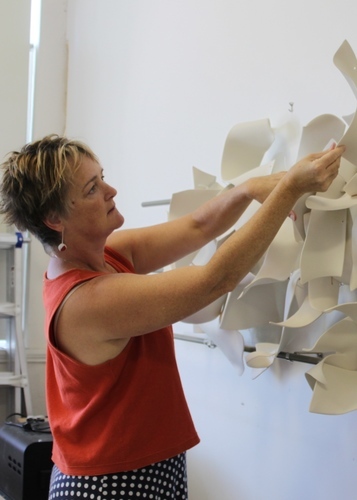 Of her award-winning work she says: “The shapes that emerge are a conversation between my hands and the material. They are both bricks and windows--puzzles that are influenced by the space they inhabit, and by the people that experience the work.” Elizabeth has exhibited in venues across the country and her work is in both national and international museum collections. Her work has been featured in numerous books and magazines. Elizabeth has completed more than 15 commissions in 10 states. Her client list includes banks, hotels, clubs, condos and private homes.